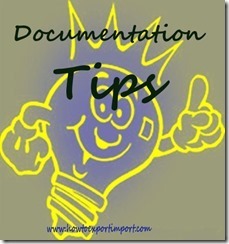 Why documentation required for exports? If any dispute arise with your overseas buyer, these written information helps in overcoming misunderstanding and oversight for any of both. Socio-economic and political issues of buyer’s can not be updated during this past life especially due to continues changes happens. So proper documentation helps you and your overseas buyer in handling your transactions in all means including time management, payment protection, claim on loss etc. In India, Foreign Exchange Management Act regulates the import export trade. I will explain you major 03 perspectives in documentation. a). Commercial purpose: Once the export order finalized between buyer and seller, normally a contract of sales is prepared mentioning all terms and conditions each exporter and importer should follow. So all related documents like invoice, packing list, certificate of origin, insurance, bills of exchange etc. are prepared on the basis of sales contract signed by both importer and exporter. b) Legal perspectives: In India, all import export trade activities are effected legally as per the guidelines of Foreign Exchange Management Act. In each country, there will be government regulatory authority to control the import and export of the said country’s trade. The government of each country has their own instructions to have export documentation legally must be filed. c) Incentives: You can not claim any government assistance, support unless you have a proper documentation on your exports. There are many financial assistance and supports given government of each country to support exporters and earn foreign exchange which is the indication of wealth of the respective nation. 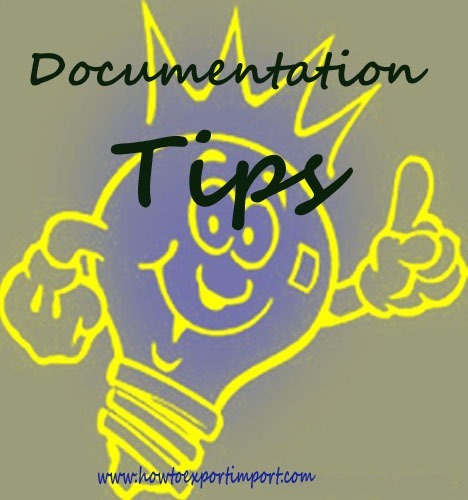 Based on the above, it is clear that proper documentation plays a very important role in an export business. Tejas koladiya. : On 12 February 2015 I like to Start My Own cement exporting Business From india. i Like to start Business As trader.Please Share Your Experiences with This Commodity. please also share Some Procedure to start business & Custom processes regarding particular Commodity mention Above.I am Also Looking For Truth full Buyer For Cement Export. please do the needful for same at urgent bases,I am Appericate Your Kind Co-operation. abhijit ghosh : On 12 February 2015 i have recently joined in a shipping CHA in Vizag. As i am totally new to this field i don't about the procedures of Export or import. Sir i request to your good self please guide me, please provide me the step by step procedure for Export and Import. mayur vekariya : On 14 February 2015 I am begginer in import export market.I am looking for to import sd card and pendrive from china.I am in worry regarding under points.would you please guide me?I have three question to ask you. 1. As a importer which is convieant way of payment to exporter. 2. how to check quality of goods which you are importing? 3. what happen when your goods are not up to the order? Do they change /replace my good? any insurance for that? Pravin Wagh: On 14 February 2015 I'm eager to understand the business of import and export. I'm not a manufacturer but keen to start import export firm. I have read the information provided on your site and was indeed helpful. I appreciate you for the effort you took to put your knowledge in the blog.There are lots of questions in my mind but I would like to put few to you. 1) Once I apply for exim license and after acquiring it, how should i go ahead? How should i contact buyers or sellers from other country? I mean is there any reliable database? 2) How should i verify whether the buyer or seller from other side is genuine? I came across lots of article on internet speaking about fake agencies and companies. 3) Since I'm very new to this field I would like to start small to understand the ropes of business. Where and how should i get my first hit? is there any online tendering system or networking system where i can get directly intouch with the buyers and sellers? 4) Is there any business code or MOU between my buyer or seller regarding future business prospect? Suppose if i try to promote business of indian manufacturer in foreign country; will in future I'll be cut-out as middle man? In case what is code or what should i do? Admin: On 14 February 2015 Hello mayur vekariya, Read other articles in this web blog. Vivek K : On 19 February 2015 I'm working in a private firm and would like to get into export of machined components. Hence I would like to get contacts looking for outsourcing from india and how to approach them for opportunities. Temitope Bello : On 06 August 2016 I have gone through your write ups on how to export and am really grateful for your insights and especially your write on LC it is an eye opener may god bless you. I really want to tap into your experience and ask for friendly advice on how to get direct buyers of hardwood charcoal from Asia, Europe, Middle east and America.I have just started the charcoal business and i need buyers who are verified and will not default when they have shipping documments. It is hard to export the charcoal and for someone to take the documents and not pay. I am waiting earnestly to hear from you. Manish Barot : On 12 August 2016 I am Manish from Gujarat, India, one of your student, sir I wanna ask to you how to use import export site step by step kindly inform to me.